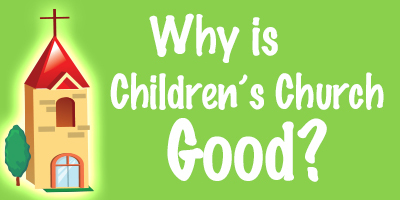 Why is Children’s Church Good? The idea of children being blessed by the church is firmly rooted in scripture. In Mark 10:13-15, Jesus welcomed the little children into his arms and blessed them. Christ’s message is clear: kids belong in church just as much as adults. Although our children cannot physically interact with Jesus today, our kids can be introduced to his message, his character, and his very essence through the preaching of the word. This is the main benefit offered to kids with Christian parents: the preaching of the gospel of the glory of God! And while a child does not have to her forehead sprinkled or be dedicated to listen, she does have to be within earshot. For this reason, I believe welcoming children into church is a necessary, good, and blessed activity that all churches should pursue. Now some may counter that kids learn differently today. Because of YouTube, twitter, and video games, they say kids need more music, more freedom, or perhaps they actually need more structure. Who knows? Regardless, many a good church is looking for ways to help their kids bounce out of the sanctuary. And while it’s true that kids are definitely more energetic than your average Baptist, it’s also true that there is one gospel and one name under heaven by which all men and women, and children get saved. As Dr. Martyn Lloyd Jones once said, “There is no greater fallacy than to think that you need a gospel for special types of people.” Our kids don’t need the gospel message repackaged. They just need the gospel! However with that said, I also recognize that many of the cute, smiling kids who accompany their parents are unredeemed. Others are unsettled because they have different parental rules every other weekend. And some simply lack the self-control needed to sit through a service for a variety of reasons. Our goal as a congregation cannot be to force children into our nicely sculpted programs. If we ask kids to sit through an hour service when they can’t sit still for more than 5 minute, we will frustrate them and their parents. Regardless of how valid our theology is, we will have failed to lovingly disciple these families seeking the community of Christ. The church should always be a place where truth is infused with love and compassion. Although we need to encourage our preaching pastors to preach with children in mind and discourage our church members from scowling each time a child rustles some paper, we also need to be prepared to care for families the moment they enter our doors. The church should help kids and parents prepare for corporate worship. I think there is a need for nurseries and for children’s churches. By having limited kids’ programing during the main service, we can more effectively minister to our own church family and better welcome visitors. In American culture, most kids learn how to sit through school by first grade. Consequently by 1st grade, we think most kids possess the social and mental skills needed to attend church with their family. But until that time, we hope to structure our nursery programs and more specifically our children’s church to help prepare kids to excitedly join their families in worship. FBCE’S children’s church program will follow our churches order of worship. We will have offerings, prayer, singing, and teaching. And then at the end of the year, our children’s church will climax with the graduation of our rising first graders to church. Children’s Church exists not to provide an alternative to “Big Church” but to encourage our parents and to help our kids experience the beauty of the preached word. Admittedly, no program can fully prepare a kid to obediently sit through a service. Only the redeemed will love the things of God. So parents, we will all have a few rough days. That’s ok. Don’t get discouraged or think you have failed as a parent. God’s word powerfully changes hearts. As long as our kids are exposed to the word, we have hope!